There comes a sad point in most every man's life when they have to settle down and become more practical. The single seater lightweight cart just won't work for you anymore. You've got two kids now but still need to haul and want a bit of fun. What do you do? 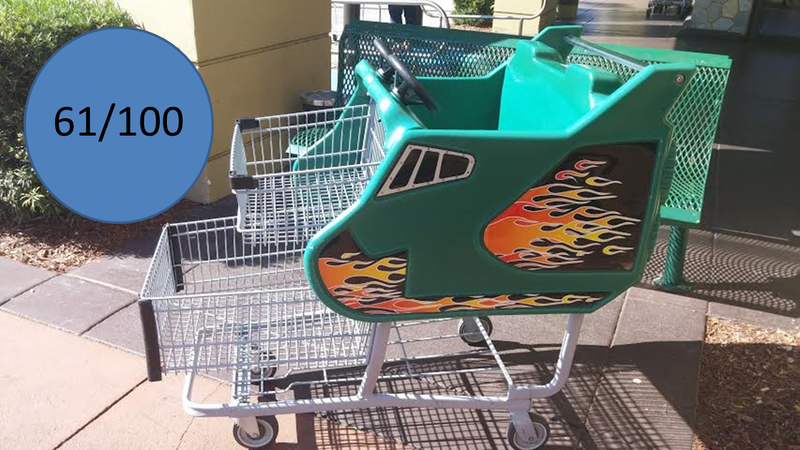 Trade up into Publix's second cart offering: the RTS Two Tier Shuttle Kiddie cart! How does it compare? Kid's in the grocery store. They are… an experience. I'm not sure if the free cookie they can get from the bakery helps calm them or just fuels their loud craziness even more. There are many nights where I cannot wait to be a father. But then I go to work and hear all the crying and the screaming and siblings fighting and I quickly change my mind. Also no kid, you are making my job harder when I hand you the bags first. And lady, get your damn kid out of the cart before I start loading! These here are the generic kiddie carts used by most every Publix across the South. They feature seating for two, two separate storage compartments, and a bottom shelf for bottles of water or Gatorade. They feature a spaceship motif with flames! And two steering wheels! They are also heavier and larger; although they hold a lot less groceries! Come on! It's a spaceship! With flames! How much cooler can you get than that? The face of the young kids when they walk by and see one of the carts available for them is just one of pure joy and excitement. It has a metal chassis covered in a roost proof finish so they can survive outside. The body is colored UV stabilized polyethylene resin and is available in 6 colors but you just like a Rolls Royce you can order custom if you wish! This here is a mixed bag. On one hand you have seating for two children but on the other you are surrounded by hard, cheap, green plastic. The interior features two small steering wheels as well; but more on those later. Although it is a bench style seat, they really are not comfortable or good for children older than seven or eight. The interior also loses points because it really isn't that practical. The grocery storage spaces are simply not deep enough. You run out of space loading these carts up very quickly; usually to the point that a second, regular cart is needed in order to get all of their groceries to the car. Another gripe here is the way of entering the cart. They have no doors, and the seats are somewhat high. Usually, a parent is required to physically lift the children in and out of the car. I wish they either integrated steps or made some clever way to make this bit easier. I have to take points away because it just isn't the best. Compared with the 2014 model, these carts are a lot heavier. Factor in two children and some groceries as well as the hard plastic shell and extended wheelbase and you have a recipe for much more sluggish acceleration. This is due to the fact that it's the same powertrain as the smaller, lighter model: you! The brakes are again nonexistent; literally. You pulling on the cart is what stops it. Luckily, the added mass does actually help a bit here. The extra pounds help stop the cart from rolling as much. Now getting these carts back inside when one of my fellow front service clerks doesn't follow the customer out becomes challenging. It is essentially a two handed job; my left pushes a group (usually no more than 4) of the normal carts while my right pulls the kiddie cart from the front. This is where the weight is interesting because it takes a lot more force to keep these rolling. There is no real suspension here. The wheels are again directly bolted to the frame. The ride is quite firm; especially on some rougher segments of road. Surprisingly, these carts are not too terrible off road either; handling puddles, dirt, and deep ditches with surprising ease. These small steering wheels kill the handling aspect here. They are narrow and do not allow for a good grip. They feel disconnected from the front wheels; as if you have no control over the car. You are better off using the handle in the back. Similar to the newer carts, it's nicely rounded and allows for a comfortable grip. These carts, due to the extra weight, stay grounded a lot more. Understeer is a serious issue with this model. They also seem to have added a whole bunch of safety nannies like traction control and stability assist. I say this because these carts do not drift. I guess it kind of makes sense; you have kids now so you need to be safe. It is however a little disappointing; especially when trying to impress that cute cashier. Since this model uses the same drivetrain as the new carts, it carries over the one speed automatic unit. It is very smooth and entering reverse is quite easy and is one of the smoothest shifts I've ever felt. These carts, riding on a different wheel, produce a different, unique noise. They have a low rumble in a sense across the smooth poured epoxy floor. Outside of the store, the added weight quiets the warble effect that is hated so much from the new carts. They also get the added benefit of the cool sounds coming from that new SRT8 Challenger or '56 Ford F100. Sadly however, the only time these carts are in use is when little kids are involved. For some reason, so many kids hate shopping; even when given the complimentary cookie from our bakery. This causes them to cry uncontrollably and cause the parents to then get loud to try and quiet them. The noise is far from pleasant. When you factor these noises with the beeping of the registers, the oh so repetitive music (Really Publix? The same Beach Boys song three times in 4 hours?) And the banging and dropping of cans and food, it can be overwhelming and rather unpleasant. Two steering wheels! One for each kiddie you stuff into the cart! That's…. about it really. It's still a shopping cart at the end of the day. There are no electronics for the kids to play with. The only sound system is what you hear coming over the PA system. It's a lot of imagination based fun here. At least the steering wheels keep the kids entertained for a few minutes. The space ship body can also allow them to be creative if they want. That is why a few points are awarded here. For a little over $400, you really are not getting much physically. It is still a shopping cart at the end of the day. However, it does its job extremely well. This cart can, and for the most part will, distract kids. From the second they walk up to the store, they smile and are so thrilled to see one available. I've had a smile put on my face when I saw a three year old boy pretending to manually shift the cart and make engine noises. I also get a big smile when I see the parents playing along and pushing the cart where the kid pretends to steer. These carts may be able to harness our passion and spread it to our youth. It's a great way to get kids thinking about driving. Because of that, a healthy number of points need to be awarded. For what it is, this cart really does a great job. You can entertain two children and still get most of your shopping done. Sure, it isn't perfect; but hey your only other choice is literally to walk. All in all, it may not be as fun to drive as the single seaters, but once the kids grow up, you can go back to the sport carts any time you want; they will always be waiting for you. Engine: How are you built? 0-60 Time: How fast can your car reach 60? Tow this shopping cart behind you and there's your answer. Top Speed: How fast can you push? MPG: How much gas did you use to get to the grocery store?